PAGASA has been raised the storm signal no. 3 in the 3 areas in Luzon. 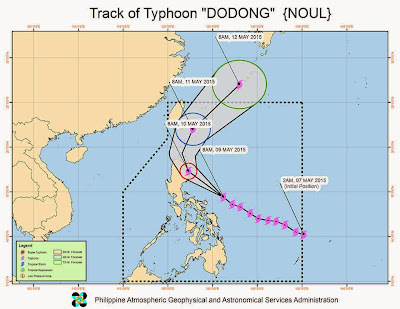 As of 11 a.m. advisory on Saturday, Bagyong Dodong (international name "Noul") moves closer to land. State weather bureau spotted Bagyong Dodong at 210 kilometers northeast of Virac, Catanduanes, with a maximum sustained winds of 160 kilometers per hour (kph) near the center and gustiness of up to 195 kph. PAGSA said, "As of 12:00 p.m. the eye of Typhoon DODONG (NOUL) was located based on all available data at 445 km East of Infanta, Quezon (14.7°N, 125.8°E)." The 3 areas under storm signal no. 3 are Cagayan, Isabela and Northern Aurora. They will experienced a winds of 121 to 170 kph in at least 18 hours, PAGASA said. Expect to experience the heavy to intense rainfall within its 200-kilometer diameter. "Storm surges of up to 2.5 meters are possible over the eastern coast of Camarines Sur, Quezon and Isabela," according to PAGASA. On Early Sunday, Bagyong Dodong is expected to make landfall over the coast of Isabela-Cagayan area and moving west northwest at 20 kph. Typhoon Dodong is the fourth typhoon to hit the country this year and expect to exit the Philippine area of responsibility (PAR) by Monday evening. Comments or suggestions about "Bagyong Dodong 2015 Update - Signal No. 3 Up" is important to us, you may share it by using the comment box below.